On a beautiful cold winters day, Tina & Gary ‘tied the knot’ in the wonderful surroundings of Woodhall Manor. While the winter light disappears quickly, it does bring other opportunities for the photographer! 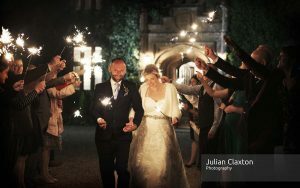 Thankfully, Tina came prepared with enough sparklers for each guest and with the guests happy to brave the freezing conditions for a few minutes we created a wonderfully atmospheric scene to celebrate their union. Wishing you a happy lovely life together.